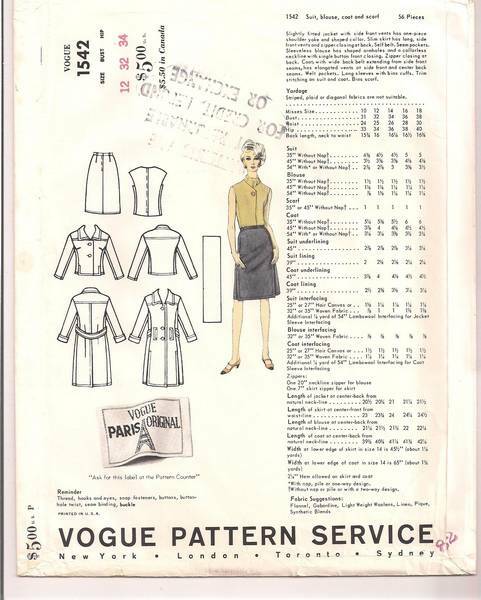 Vintage 1960's Vogue Paris Original pattern. Slightly fitted jacket with side front vents has shoulder yoke and shaped collar. Slim skirt has long, side front vents, seam pockets, back zipper and self belt. Sleeveless, collarless blouse has shaped armholes and single button closing at neckline. Coat, with wide back belt extending from side front seams, has elongated vents at side front and center back seams. Long sleeves with bias cuffs. Welt pockets. Bias scarf. Trim stitching on suit and coat. Pattern is uncut, complete an in factory folds.